As the air is filled with the smell of fireworks, and the sky is lit with a billion little sparks, I look back and see a very blessed 2008. Thank you Lord for the past year. May 2009 be as blessed and as full as this year was. Goodbye 2008, you've been good to me. Salamat! In an effort to inspire others as others have inspired me when I was starting out, I am launching a project called Handmade Pilipinas. Basically, the project entails a series of blog posts that deal with crafting as a viable source of income and crafting for sustainable development. I hope to post short articles discussing ideas on marketable craft projects you can do at home, DIY tutorials, inspiring stories from several professional crafters (aka people who make money off their crafting hobby), and practical business how-to's for the indiepreneur. As of date, I have contacted several inspiring individuals whose stories may inspire you to start your own handmade adventure. Watch out for this series of interviews. Today, we start by discussing the hottest craft material du jour. This series of articles will be introduced part by part, so always check back for updates. 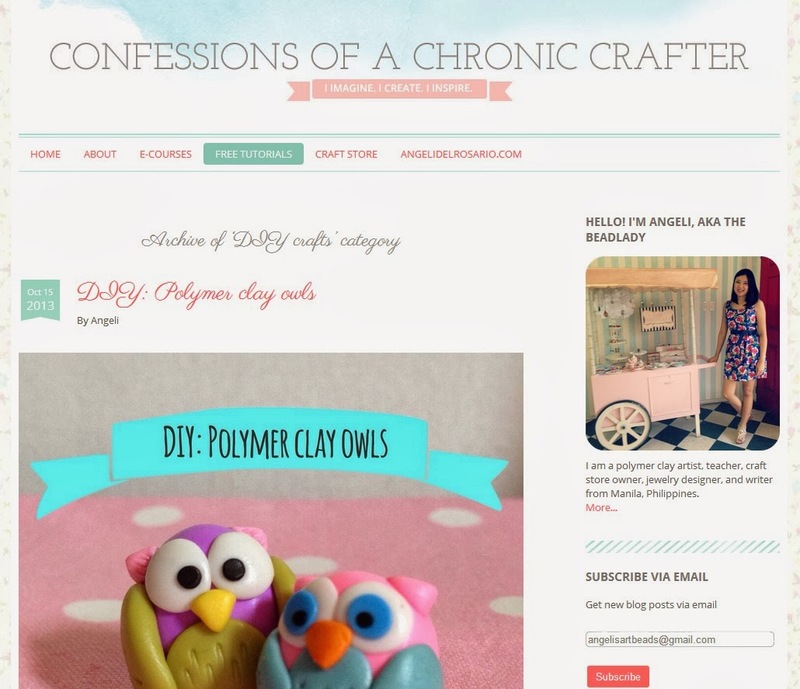 Search for "handmade pilipinas" in this blog. Since my business appeared on the local media's radar in 2007, I have gotten a lot of emails asking for information on how to start working with polymer clay. The countless emails and texts I get, asking the same questions over and over again, and the dark clouds of recession looming in the not-so-distant future inspired me to start a new project for 2009. I have been blessed with so many opportunities, and received such positive feedback and support from the community the past year, that it is difficult not to give something back. This coming year, I will transform this personal blog into a craft reference of sorts. I will be posting how-to articles, craft tutorials, and related articles which aim to help others jump start their handmade venture. I hope to inspire people to think about craftivism and the handmade life, to inspire others as I have been inspired by others before me. This project has been months in the making. Let's cross our fingers and hope for the best! 1. 2009 will be a brand new year for this blog. I'll be posting more often and more diligently, about topics more interesting and helpful. I'm starting a new project which I hope to launch by the second week of the coming year, God-willing. It's an exciting time! 2. I am planning on tweaking my operations a bit. 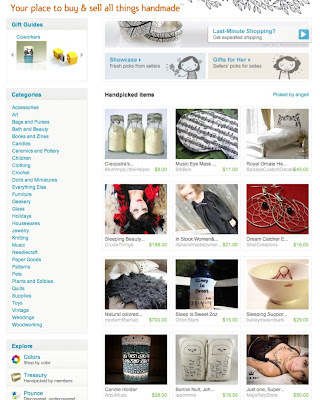 I plan to no longer post products on Multiply, as I find Etsy way easier to manage. I do plan to keep the Multiply site for updates, behind-the-scenes pictures, and bits of blog posts. 3. This year, I opened a plurk account for micro-blogging. In an effort to de-clutter this blog, that's where I'll post my senseless ramblings from now on. Creating treasuries is so addicting! I made two more after the black and white insomniac picks of a few days ago. (See previous post). The one above is still live, and will expire in a few hours. Click, click, click please! 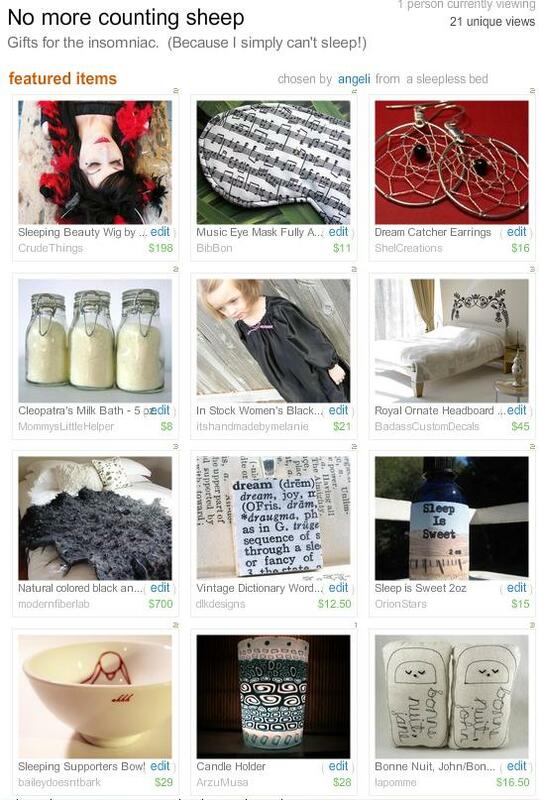 This treasury features my favorite carnival-inspired items on etsy. Aren't they the cutest? Those adorable pink sneakers are to die for! If only they were in my size. The jack-in-the-box ornament I would love to get too! Treasury #2 "Take me to the fair, daddy." Picks: 1 peppermint pinwheel, 2 fairy floss, 3 felt lollies, 4 jack-in-the-box, 5 velvet sneakers, 6 ferris wheel pendant, 7 carousel necklace, 8 funky kiddie hat, 9 vintage admission tix, 10 carnival photograph, 11 cotton candy necklace, 12 ice cream tee. I finally snagged my first ever treasury on etsy! I picked the 12 items above and made a collection titled "No more counting sheep". It took me months to get a slot, since hundreds of people literally wait for the treasury to open up. The treasury is "a member-curated gallery of short-lived lists of 12 hand-picked items each (plus four alternates). It functions as a high-demand (and pretty!) promotional tool that many devoted Etsians fight to get. 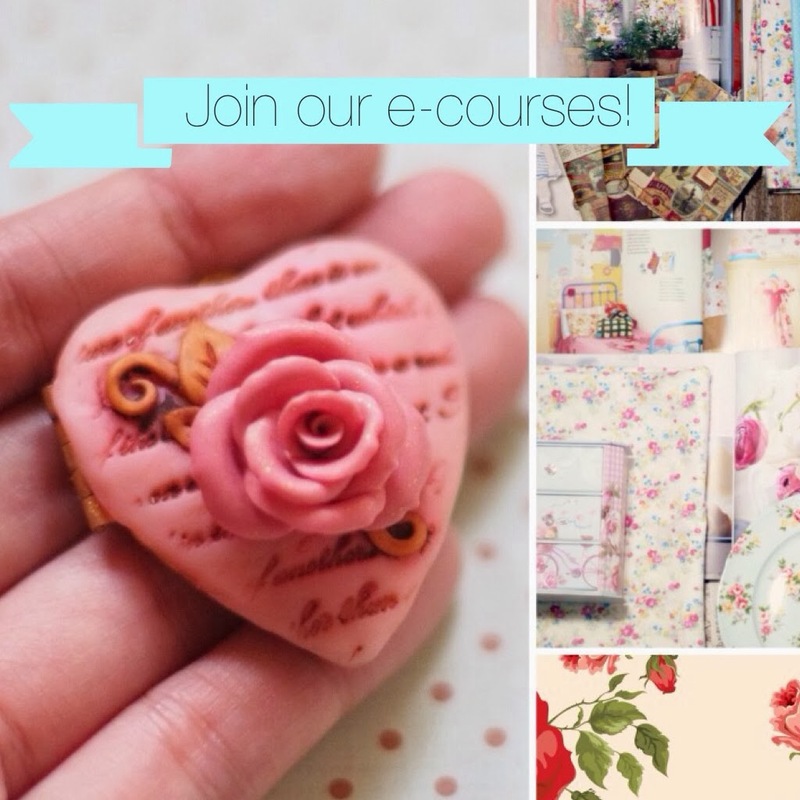 Members can feature their favorite items, items selected on a theme, or just however they like. The Treasury is not intended for self-promotion, but instead to acknowledge and share the many cool things for sale on Etsy. Admin often choose an exceptional Treasury list to promote on the home page and occasionally make them to tie into Storque articles or special events and occasions." It went live on the front page on December 21, 9am New York time. ***I didn't make the title up, lifted the phrase off etsy's treasury page, lol! Thank you for your gift!!! Natouch ako! 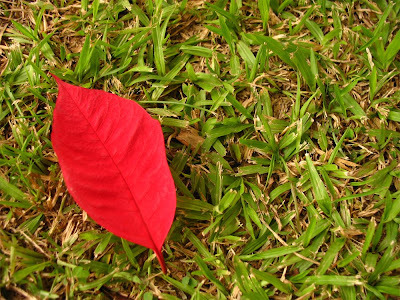 A fallen pointsettia leaf on the lawn. Isn't that so Christmas-y? Not photoshopped or altered in any way. If there was only one word I could use to describe myself, it has to be CHOCOHOLIC. 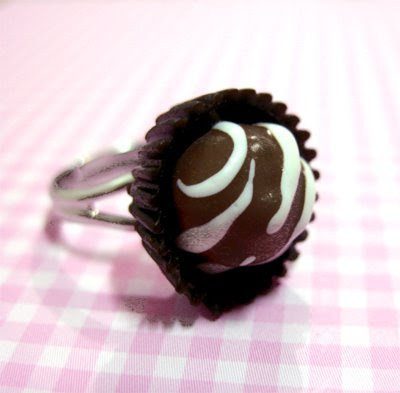 I simply can't live a day without chocolate. 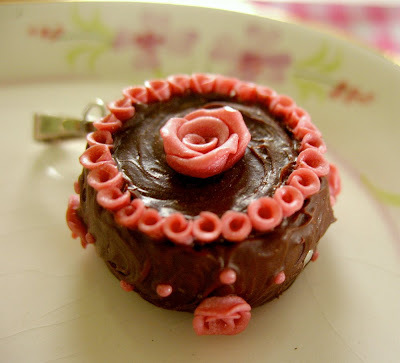 That explains my seemingly endless line of dessert charms, like the one pictured below. Sometimes, I'm lucky to find surprising coincidences. We had these super yummy mini cakes from Bizu last Sunday. The photography's awful, but I wanted to dig right in. 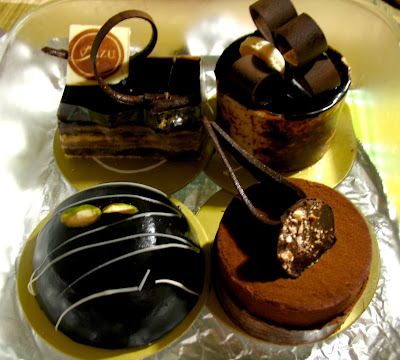 Who has time to compose a proper shot when there are four mouthwatering chocolate cakes right in front of you? 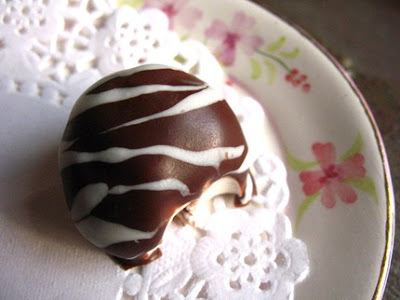 If you're craving for chocolate, but are afraid of those nasty calories, try one of my chocolate truffles. 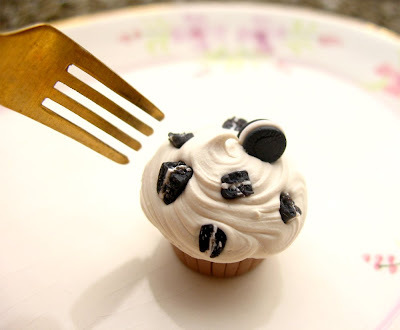 They look so real, you can almost taste them! Teehee. Chocolate, chocolate, chocolate. It makes the world go round. Where did November go? One minute I was thinking of making Halloween trinkets, the next minute carolers are knocking on my door!